The MMA7660FC is a digital output I²C, very low-power, low-profile capacitive micro-machined accelerometer featuring a low pass filter, compensation for zero-g offset and gain errors and conversion to six-bit digital values at a user configurable output data rate. The device can be used for sensor data changes, product orientation and gesture detection through an interrupt pin (INT). 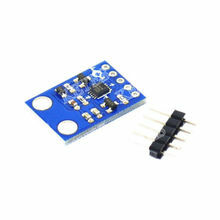 Communication is handled through a 2 pin I2C interface, available on a wide range of microcontrollers. The I2C address by default is 0x4c.